How do you want to be remembered? As a millennial mother, professional, and wife in my early 30s, I struggle with this "memorial" question on a frequent basis. Millennials (like myself) want to be remembered for a variety of reasons, but one of the most important reasons that I would like to be remembered is because I made a positive contribution to my community, my state, my country, and perhaps beyond. In my current work position (as a professor), I have many opportunities to positively impact each of those areas, but my family position takes priority (at least for the next few years). My daughter is still relatively young, but I long for the day of the future when I can take her to volunteer in the community, nationally, and also internationally. I've discovered that the key to true work/life balance is knowing that it does not truly exist. Yes, you can let the e-mails sit in your inbox until the next day, but usually millennial moms are always thinking about work (from sun up to sun down). By involving your children in your daily activities including answering e-mail, attending family-oriented family functions, and in my case - grading papers, my daughter realizes the importance of a hard day's (and night's work). She has also learned valuable skills (and concepts) along the day. Recently, I discovered that she can correctly identify a professor, a university, a classroom, and yes - she can identify Blackboard (our learning management system as well). 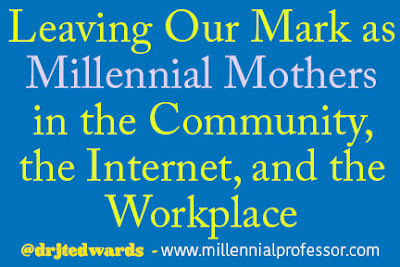 Each summer, I look forward to meeting new millennial moms and refining my existing millennial moms (in Texas) by attending a summer blogging conference. We meet in San Antonio and our families (the dads as well) connected and everyone learned techniques focused on how to make their blogs more effective. As first, it was difficult for me to think about how I could connect with the bloggers because of them were stay-at-home mothers, but when I ventured out of my shell I quickly realized that these were some of the most dynamic, down-to-earth, outstanding millennial mothers that I have ever encountered. These mothers are making their mark on the internet and are impacting how corporations are marketing to the millennial consumer. I look up to all of these millennial mom bloggers, they inspire me to be a better blogger and mother. 5 - An increased value for mentorship and networking (O'Connell, 2015) Huffington Post Article. These qualities help will help millennials determine their worth, their impact, and their future in the the workplace. As the older millennials (especially the mothers) enter the middle portion of our careers, we have a few items to determine - How do you we to be remembered? 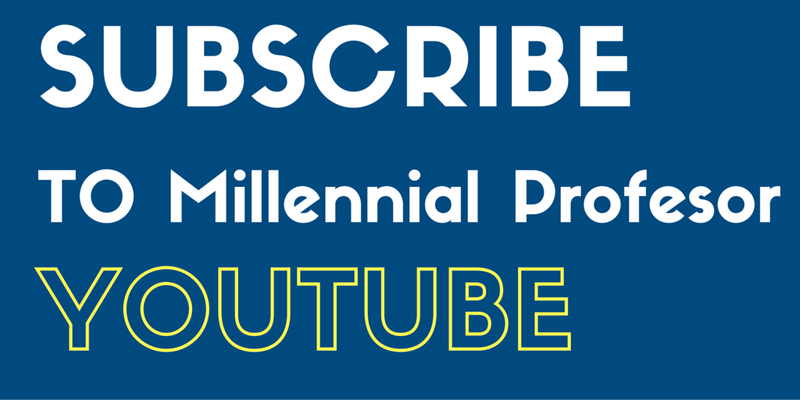 As a millennial mothers, millennial fathers, and all other types of millennial professionals, how will we make positive contributions to the community, the state, the country, and beyond?